ENGLAND rugby players Jonny May and Will Collier have taken time to pay tribute to the war dead at Brookwood Military Cemetery. They were invited as part of the Commonwealth War Graves Commission’s centenary, and in recognition of the Commission being the Rugby Football Union’s nominated services charity for this season. May is currently touring with England in Argentina where they have two matches against the Pumas. The first one is on Saturday 10 June. The two players laid a wreath at the cemetery and visited the CWGC Centenary Exhibition, currently on display at Brookwood. In its centenary year, the CWGC has linked up with the RFU to raise awareness of the rugby players who died in the two world wars. 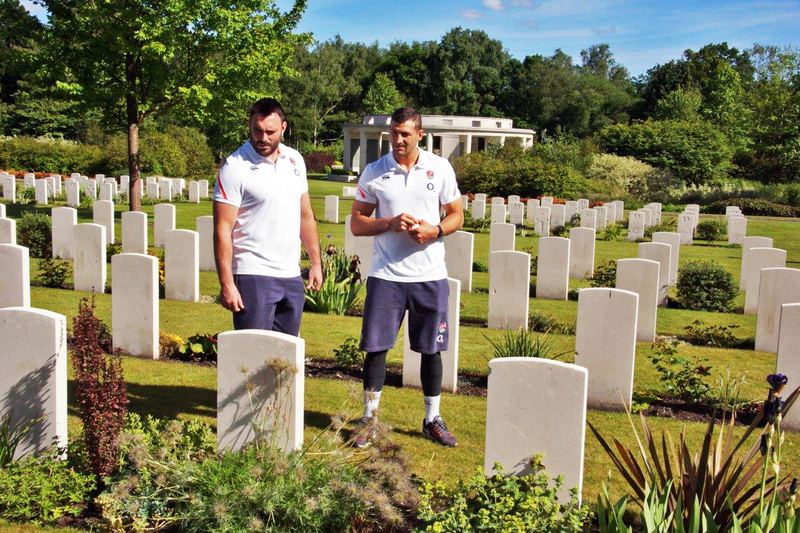 The Rugby Remembers campaign encourages young people to discover these stories and visit their local war graves. May and Collier met some of the young people involved in the campaign. The CWGC’s Centenary Exhibition, For Then, For Now, Forever, is free to visit and is open every day from 10am to 4pm.